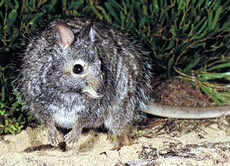 The banded hare wallaby is found on Bernier and Dorre Islands in Shark Bay, Western Australia. Adults weigh from 2.9 to 2.6 lbs and females are usually larger than males. It is referred to as a "hare" wallaby because of its hare-like jumping ability and speed. They also have a habit of sitting in well formed hare-like squats. The fur of the banded hare wallaby is long, soft, and thick and its ears are short. They can grow up to 46 cm in length and the tail is short. The banded hare wallaby prefers to feed at night and eats grasses, spinifex, fruit and a variety of shrubs and plants. It is a sociable animal and likes to congregate with other wallabies under bushes during the day. Males are very aggressive toward each other and fight for food and for females to mate with. Females give birth to one and sometimes two babies. The young spend about six months in the mother's pouch and are weaned at nine months. The banded hare wallaby has disappeared from most of its range because of the clearing of vegetation for agriculture, competition for food with nonnative mammals and predation by nonnative animals like cats and foxes. 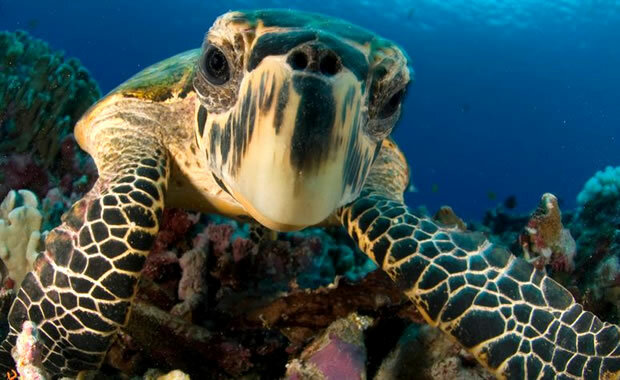 It is now protected by law in Western Australia. The last population estimate (from 1992) was about 9,700 individuals. Current population estimates are unavailable. Copyright Notice: This article is licensed under the GNU Free Documentation License. It uses material from the Wikipedia article "Banded hare-wallaby". Glenn, C. R. 2006. "Earth's Endangered Creatures - Banded Hare Wallaby Facts" (Online). Accessed 4/24/2019 at http://earthsendangered.com/profile.asp?sp=492&ID=4. Need more Banded Hare Wallaby facts?